The Bible's Story: From "A" to "Z"
This evening I want to attempt to do something that is quite difficult for the situation and for a thirty-minute presentation. I need your help. I want you to stay with me, and I want you to think. I do not want your thinking to stop when we finish this lesson. I want you to think about this for at least several days. I fully realize what I share with you this evening is an overview. In may ways it is an oversimplification. Hopefully, it is an accurate concept and continuum. Let me begin by sharing a perspective. I think many in this audience know the basic Bible stories. However, I also think that we often have failed to connect the Bible stories we know to the overall story of the entire Bible. Let me try to illustrate the problem and the need. I am not going to ask you to say anything, or share anything, or take a test. I just want you to raise your hand. Many of us could tell those stories. Now let me ask you more difficult questions. DO NOT raise your hands--just think seriously to yourself. 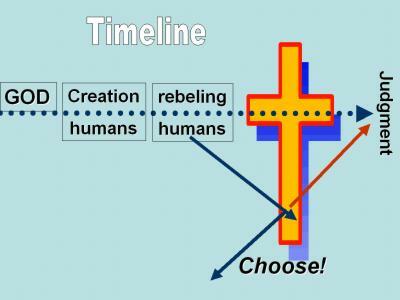 How does the story about Adam and Eve connect to what God did in the cross of Jesus? Is there any connection? If there is, what is it? How does the story about Cain and Abel connect to God's actions in the cross of Jesus? Is there any connection? If there is, what is it? How does the story of the flood connect to Jesus' cross? Is there a connection? If there is a connection, what is it? What is the connection between the formation of the nation of Israel and Jesus' cross? Is there any connection? If there is, what is it? I want to begin by giving you a real simple overview slide. There are two purposes to this simple overview slide. The first is to give you some idea of where we are going in the next few minutes. The second is to call your attention to the fact there is no change in God; we have the problem that needs fixing, not God. God is the same - from creation to the cross to the judgment. Let's start where the Bible starts--with the creation, with the declaration that God is the origin of all things. I have no idea of how long Adam and Eve lived in the ideal circumstances of the Garden of Eden. How long they were there is not really the point--the point is that there was a period when everything was ideal and human life dealt with nothing evil. However, when Adam and Eve were deceived by temptation and rebelled against God, everything changed immediately. Adam and Eve no longer could live an ideal existence. Their rebellion produced profound consequences. Their act did not merely destroy their relationship with God--their rebellion perverted God's good creation. I do not know how many children Adam and Eve had--Genesis does not say. 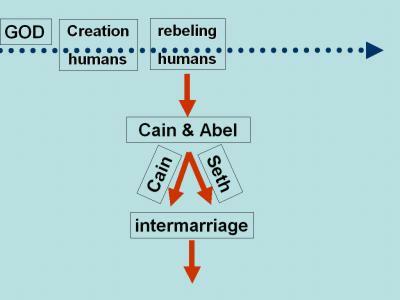 It just tells us that Cain, Abel, and Seth were three of them, and were quite significant in human history. In less than one generation people went from total good to murder! Seth is both the person and the symbol of people who were sensitive to God and wanted to listen to God. Cain is both the person and the symbol of people who wanted nothing to do with God. There was a group of people who were sensitive to God until the group intermarried with people who wanted nothing to do with God. After the intermarriage, the decline into the pits of evil continued until there was complete evil and the absence of good. Genesis 6:5,6 Then the Lord saw that the wickedness of man was great on the earth, and that every intent of the thoughts of his heart was only evil continually. The Lord was sorry that He had made man on the earth, and He was grieved in His heart. 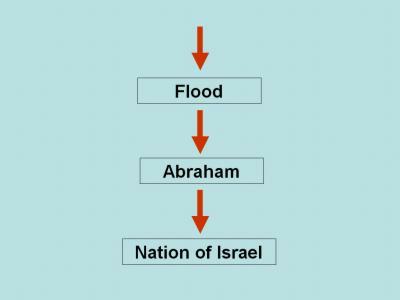 The flood occurred because God, Who is filled with grace and mercy, wanted to begin again with people who would listen to Him. Nothing short of God sacrificing His own son would work. So God began preparing to send His son well over a thousand years (perhaps 2000 years!) before Jesus came to be the Messiah, the Christ. God began with these promises made to the man Abraham. Genesis 12:1-3 Now the Lord said to Abram, "Go forth from your country, And from your relatives And from your father's house, To the land which I will show you; And I will make you a great nation, And I will bless you, And make your name great; And so you shall be a blessing; And I will bless those who bless you, And the one who curses you I will curse. And in you all the families of the earth will be blessed." God started with the childless Abraham and brought into existence the nation of Israel by giving Abraham and Sarah a child named Isaac, the child of the promise. But the nation of Israel was a constant disappointment to God from the moment He secured their freedom from slavery. Problem one: they gave credit for God's acts to nonexistent gods, or idolatry. Problem two: they placed their confidence in their identity and traditions instead of placing their confidence in God and His purposes. With all God did for that people, things went from bad to worse. 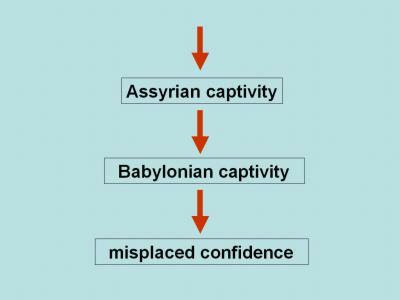 The Assyrian captivity did not end the problem. The Babylonian captivity did not end the problem. With all the discouragement and failures in Israel, God still sent the Messiah (Christ). God still provided all people [just as He promised Abraham] with a choice. 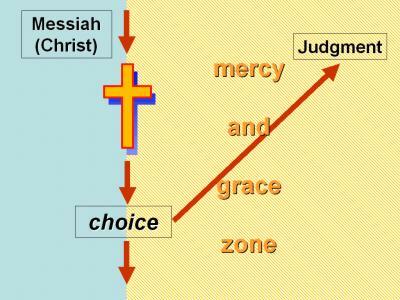 The choice: continue the decline into the pits of evil or direct yourselves toward God's acceptance in judgment. God could provide the world that choice because of what He accomplished in Jesus' death and resurrection. Only because of what God did in Jesus Christ could the world be given a choice. Our salvation has never been based on humanity's goodness. Our salvation always has been based on God's goodness expressed in His mercy and grace. John 1:17 For the Law was given through Moses; grace and truth were realized through Jesus Christ. We must grasp and cling to a basic understanding. Grace and mercy are available to us in a form that will produce salvation because of what God did in Jesus' death and resurrection. Only because of what God did in Jesus' death and resurrection do people have a choice. Never should we be so deceived or so arrogant as to think that we can [through our own efforts] return to the goodness that existed when God created. Our goal is simple: we seek God's acceptance in judgment. However, that can only happen because we accept God's mercy and grace. It is only because of the death and resurrection of Jesus that we can choose to redirect our lives. Because of Jesus Christ we can be saved, but because of our sinfulness and weakness we can never be good. Left to ourselves, we plunge deeper and deeper into evil--and often do not even realize it! I want you to listen carefully to a statement made by the author of Hebrews in the last of Hebrews 7 and the first 12 verses of Hebrews 8. The statement is based on a comparison of the Jewish high priest and our high priest, Jesus Christ. The first: to represent the people before God. The second: to offer a sacrifice for the forgiveness of the people he represents. Read with me, and listen with your heart as we focus on Hebrews 7:26 through 8:12. For it was fitting for us to have such a high priest, holy, innocent, undefiled, separated from sinners and exalted above the heavens; who does not need daily, like those high priests, to offer up sacrifices, first for His own sins and then for the sins of the people, because this He did once for all when He offered up Himself. For the Law appoints men as high priests who are weak, but the word of the oath, which came after the Law, appoints a Son, made perfect forever. Now the main point in what has been said is this: we have such a high priest, who has taken His seat at the right hand of the throne of the Majesty in the heavens, a minister in the sanctuary and in the true tabernacle, which the Lord pitched, not man. For every high priest is appointed to offer both gifts and sacrifices; so it is necessary that this high priest also have something to offer. Now if He were on earth, He would not be a priest at all, since there are those who offer the gifts according to the Law; who serve a copy and shadow of the heavenly things, just as Moses was warned by God when he was about to erect the tabernacle; for, "See," He says, "that you make all things according to the pattern which was shown you on the mountain." But now He has obtained a more excellent ministry, by as much as He is also the mediator of a better covenant, which has been enacted on better promises. For if that first covenant had been faultless, there would have been no occasion sought for a second. For finding fault with them, He says, "Behold, days are coming, says the Lord, When I will effect a new covenant With the house of Israel and with the house of Judah; Not like the covenant which I made with their fathers On the day when I took them by the hand To lead them out of the land of Egypt; For they did not continue in My covenant, And I did not care for them, says the Lord. "For this is the covenant that I will make with the house of Israel After those days, says the Lord: I will put My laws into their minds, And I will write them on their hearts. And I will be their God, And they shall be My people. "And they shall not teach everyone his fellow citizen, And everyone his brother, saying, `Know the Lord,' For all will know Me, From the least to the greatest of them. "For I will be merciful to their iniquities, And I will remember their sins no more." The Bible is not a comprehensive declaration of all God did in ages past. It is the record of how the God of goodness would not allow human failure to destroy His purpose. It is a record of how the good God with great determination and sacrifice restored our choice. It is the record of how the good God who created all things good will return all who follow Him to that goodness. Do not place your confidence in our religious identity. Place your confidence in the God who gave us Jesus as a Savior.